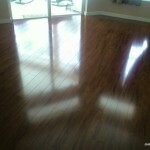 At Hardwood Floors Inc of Oviedo, we install laminate flooring the right way. You may be thinking that these floors just snap together, and therefore are easy. Well you would be right, and wrong. The act of folding two boards together is simple enough, but the details are what makes or breaks a floor. Subfloor preparation, moisture testing and sealing, proper use of expansion joints, proper expansion around all vertical surfaces, and correct installation of transition moldings are all very important parts of the proper installation of laminate flooring.